Amazon's digital assistant Alexa will be installed in some US Marriott-owned hotels, following a partnership between the two firms. Marriott is reported to have considered both Alexa and Apple's Siri. A spokesperson told the Financial Times the deal with Amazon was not exclusive. "This was not a direct comparison with Siri," said Tracey Schroeder, Marriott's vice-president of global consumer public relations. In 2016 Aloft Hotels, which is owned by Marriott, introduced voice-activated hotel rooms controlled via Siri, and a custom-built app on an iPad. 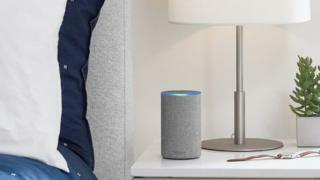 "Today's early adopter, hyper-connected global traveller wants a level of personalisation unlike ever before, and that means being able to control their hotel experience with the sound of their voice," said global brand leader Brian McGuinness at the time. However the latest news was not welcomed by all. "I will pay a premium for any hotel room that does not have one of these devices in it," tweeted journalist Kate Allen. "Alexa. Can you err leave the room?" responded Natalie de Freitas.